Party Bingo is part of Party Gaming- an online gaming company that has been in operation since 1997. Party Gaming includes an online bingo hall, an online casino, an online poker room, an online sportsbook and online backgammon. Party Bingo is owned and operated by ElectraWorks Limited. It is licensed by the Gibraltar Licensing Authority and regulated by the Gibraltar Gambling Commissioner. Their games are tested by the independent tester of gaming and wagering devices, iTech Labs. The site displays the eCOGRA seal of approval for fair gaming. 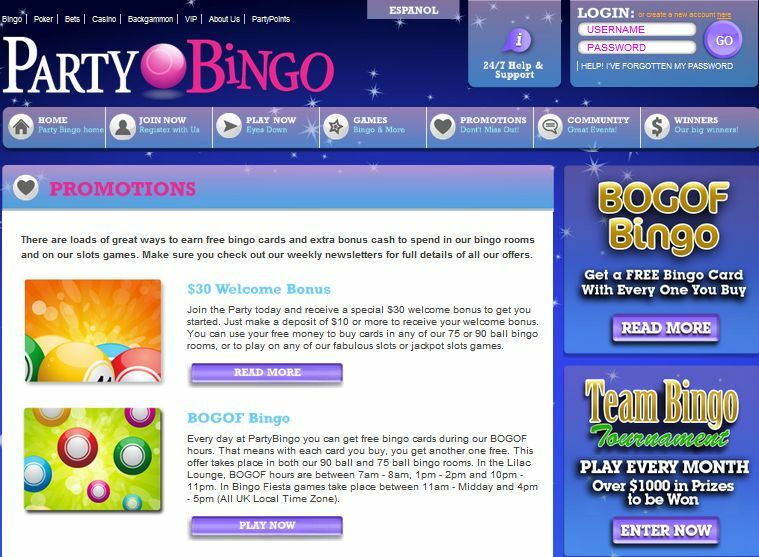 Party Bingo is powered by Party Gaming Software. The software is available in English, German, Spanish and Danish. The software is available in a downloadable version, as well as a no-download flash version for instant play. Party Bingo offers a good variety of bingo games, mini games and side games. Bingo games include 90 ball bingo, 75 ball bingo and instant bingo. Mini games and side games can be played in between bingo games or simply for a bit of variety. They include a number of slots games, blackjack, European roulette and more. New players at Party Bingo are eligible for a welcome bonus of £20 when they make a deposit of £10 or more. You are able to play two-part bingo in the Fiesta Room which gives you more chances to win on your bingo card. There are big money jackpots to be won with a £1,000 guaranteed full house jackpot game running on the last Saturday of every month. They are also paying out guaranteed prizes on the hour, every hour from midday to midnight. If you tell a friend about Party Bingo, you could receive a 50% deposit bonus up to $100 and they could receive a 100% deposit bonus up to $100. Party Bingo guarantees to award £1,000?s every single day. The Bingo Rewards Club has 5 tiers – leopards, jaguars, panthers, tigers and the invitation only, lions level. The reward club offers many benefits to its members including a dedicated email address for enquiries, a personal call from a team member to ensure everything is running smoothly, a quarterly newsletter, daily free calls, weekly bonuses and special gifts including a birthday gift and a Christmas gift. If you have any queries when playing at Party Bingo you can access the FAQ section on their website. If you do not find the answer to your questions in the FAQ section, you can contact a customer service representative 24 hours a day, seven days a week. They can be contacted via telephone or email. 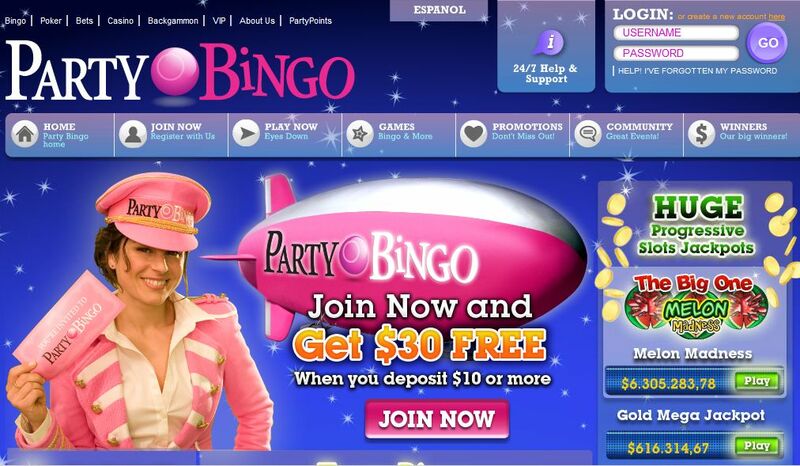 Players can make deposits info their Party Bingo account via a number of secure and convenient methods. These include VISA, Master Card, EntroPay, ClickandBuy, NETeller, bank transfer, laser, EPS, Ukash, UseMyBank, Moneybookers, Maestro, Solo, bank wire and GiroPay. They accept multiple currencies including US dollars, UK pounds and euros. They employ 128-bit SSL data encryption technology to ensure the security of your financial information. Is it illegal to play poker online in the USA?